NEMO Helio LX Pressure Shower. The Helio™ LX shower is the new larger version of NEMO's beloved Helio™, with a couple stellar new upgrades. Unlike conventional gravity-fed systems, Helio™ systems rest on the ground and are pressurized by their integrated foot pump, delivering excellent water pressure for showering, cleaning dishes, or rinsing off gear. The new LX model includes a threaded fill cap with an opening big enough to reach inside for cleaning. NEMO also designed a clever silicone sleeve that holds the nozzle in the open position inside the Heliopolis™ shower tent just like your shower at home. The LX model has a 22L/5.8 gallon capacity with a 7'/2.1m hose, providing 7-10 minutes of water pressure. Unlike conventional gravity-fed showers, Helio LX doesn't need to be hung. It sits securely on the ground. 5 gallon capacity and 20% more water pressure that the standard Helio model! 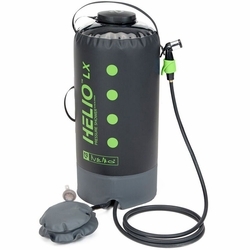 Using the included foot pump, Helio LX offers 7-10 minutes of steady water pressure, great for cooking, cleaning, pets, surf, emergency and homes uses.